VHS was a hugely successful video format from the late 1970s-late 1990s. It was adopted widely in domestic and professional contexts. Due to its familiarity and apparent ubiquity you might imagine it is easy to preserve VHS. VHS is generally considered to be a low preservation risk because playback equipment is still (just about) available. There is, however, a huge degree of variation within VHS. This is even before we consider improvements to the format, such as S-VHS (1987), which increased luminance bandwidth and picture quality. The biggest variation within VHS is of recording speed. Recording speed affects the quality of the recording. It also dictates which machines you can use to play back VHS tapes. 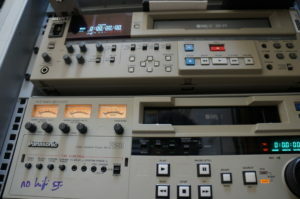 Domestic VHS could record at three different speeds: Standard Play, which yielded the best quality recordings; Long Play, which doubled recording time but compromised the quality of the recording; Extended or Super Long Play, which trebled recording time but significantly reduced the recording quality. Extended/ Super Long Play was only available on the NTSC standard. It is generally recognised that you should always use the best quality machines at your disposal to preserve magnetic media. VHS machines built for domestic use, and the more robust, industrial models vary significantly in quality. 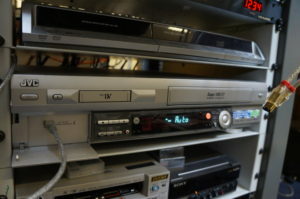 Richard Bennette in The Videomaker wrote (1995): ‘In more expensive VCRs, especially industrial models, the transports use thicker and heavier mounting plates, posts and gears. This helps maintain the ever-critical tape signal distances over many more hours of usage. An inexpensive transport can warp or bend, causing time base errors in the video signals’. Yet better quality VHS machines, such as the SONY SVO-500P and Panasonic AG-650 that we use in the Great Bear Studio, cannot play back Long or Extended Play recordings. They only recorded—and therefore can only play back—Standard Play signals. This means that recordings made at slower speeds can only be transferred using cheaper, domestic VHS machines. This poses two significant problems within a preservation context. Firstly, there is concern about the availability of high-functioning domestic VHS machines in the immediate and long-term. Domestic VHS machines were designed to be mass produced and affordable to the everyday consumer. Parts were made from cheaper materials. They simply were not built to last. JVC stopped manufacturing standalone VHS machines in 2008. Used VHS machines are still available. Given the comparative fragility of domestic machines, the ubiquity of the VHS format—especially in its domestic variation—is largely an illusion. The second problem is the quality of the original Long or Extended Play recording. One reason for VHS’s victory over Betamax in the ‘videotape format wars’ was that VHS could record for three hours, compared with Betamax’s one. As with all media recorded on magnetic tape, slower recording speeds produce poorer quality video and audio. Which leads us to a further and significant problem: the ‘press play’ moment. Interchangeability—the ability to play back a tape on a machine different to the one it was recorded on—is a massive problem with video tape machines in general. The tape transport is a sensitive mechanism and can be easily knocked out of sync. If the initial recording was made with a mis-aligned machine it is not certain to play back on another, differently aligned machine. Slow recording complicates alignment further, as there is more room for error in the recording process. The preservation of Long and Extended Play VHS recordings is therefore fraught with challenges that are not always immediately apparent. Aesthetically, VHS continues to be celebrated in art circles for its rendering of the ‘poor image’. The decaying, unstable appearance of the VHS signal is a direct result of extended recording times that threaten its practical ability to endure. Variation of recording time is the key point of distinction within the VHS format. It dramatically affects the quality of the original recording and dictates the equipment a tape can be played back on. With this in mind, we need to distinguish between standard, long and extended play VHS recordings when appraising collections, rather than assuming ‘VHS’ covers everything. One big stumbling block is that you cannot tell the recording speed by looking at the tape itself. There may be metadata that can indicate this, or help you make an educated guess, but this is not always available. We recommend, therefore, to not assume VHS—and other formats that straddle the domestic/ professional divide such as DVCAM and 8mm video—is ‘safe’ from impending obsolescence. Despite the apparent availability and familiarity of VHS, the picture in reality is far more complex and nuanced. As ever, Great Bear are more than happy to discuss specific issues affecting your collection. Get in touch with us to explore how we can work together. You are currently browsing the greatbear analogue and digital media blog archives for July, 2016.